In the last several years, the popularity of ball pythons (Python regius) has skyrocketed. It's not surprising; the snakes have broad appeal. Their color, pattern, proportions and disposition make them one of the most commonly kept reptiles, and tens of thousands of them are exported every year from Africa. The snakes can endure some husbandry mistakes, and any first-time snake keeper should be successful with them. The needs and requirements of animals in captivity are the same as their wild counterparts. However, it is impossible to duplicate the natural habitat of a wild animal with all the variables that the real world presents. Instead, we must focus our efforts on those requirements that are absolutely necessary for the animal's health and well being. Considering the huge geographic area in which python species are found, it's a little surprising that their requirements in captivity are so similar. Some are terrestrial, others are arboreal; some are from wetter areas, others frequent more arid areas; but most thrive in captivity under similar conditions. For that matter, most of the tropical boas do as well. Therefore, providing for the basic needs of a ball python is fairly simple, but it requires several pieces of equipment. The first and most important item is the cage or enclosure itself. Its primary purpose, of course, is to safely contain the snake. Remember, the little guy has a lot of time on his hands, and if there's a way out, he'll find it. My own cages began as an assortment of cracked aquariums with screen tops weighted down by books and bricks. Today, you can buy a variety of ready-made cages. It's also fairly easy to build an enclosure for your ball python or to convert a readily obtainable container into a cage. Wood, plastic and glass are all acceptable materials for cage construction. I now use cages constructed of ABS plastic with sliding glass fronts. These cages have a nonporous finish that allows for easy cleaning and sterilization. All corners and edges are rounded, leaving no difficult-to-clean areas. The cages are lightweight and have glass fronts for easy viewing. Best of all, someone else made them already! Ball pythons are terrestrial animals that rarely, if ever, climb. Floor space is more important to them than the height of the cage. A baby ball python can be kept comfortably in an enclosure the size of a shoe box. The largest ball python can live its life in a cage measuring 18 by 30 inches. These suggestions for cage sizes will meet the snake's minimum requirements. Larger cages are acceptable, but very large enclosures may cause some difficulties during feeding; sometimes it's difficult for the snake to find its food in a large cage. Also, it is more difficult to maintain proper conditions in a larger area. While the main purpose of a cage is to contain the snake, it must also enclose a suitable environment for its inhabitant. Proper temperature and humidity levels are essential for maintaining a healthy ball python. The ball python comes from a more arid environment than most pythons. Even so, it still requires a fairly high level of humidity. Ball pythons spend most of their time in burrows where it's more likely to be a little damp. When they leave, it's usually at night when temperatures are cooler and the level of moisture in the air is greater. The wild snakes do not expose themselves to the dry conditions that their natural environment presents. In captivity, when given a choice, they will do the same. Because ball pythons are tropical animals, they prefer temperatures that are higher than most of us feel comfortable with in our homes. This makes it necessary to provide supplemental heat for the snake's cage. Temperatures in the 80s (Fahrenheit) are ideal. You can provide heat in several ways. I use heat tape or place a heat pad under the cage. Light bulbs or ceramic heaters also snakes are color blind and that they might not be able to see the light from light bulbs with a red painted coating. I think the snakes are aware of the light, but at least they are not exposed to a 24-hour-long day (as they would be under a glaring white bulb). Heat pads and ceramic heaters do not emit light and are more efficient at converting electricity to heat. At first, it might seem that providing an even level of heat throughout the cage would be most desirable, but it is not the case. In the wild, snakes have the opportunity to choose the conditions that they prefer or need at the time. We can provide some of these choices in captivity by placing the heat source on one end of the cage. This provides a range of temperatures for the snake. The temperature will be warmest next to the heat source and will become cooler as the snake moves further away. By giving the snake this gradient, it will have the opportunity to choose the temperature it needs at the time. A temperature range of 80 to g0 degrees Fahrenheit is ideal. The temperature of the heat source itself can exceed this range if the temperature range is otherwise satisfactory. Temperatures in the snake's natural habitat drop at night when the sun goes down. A small fluctuation at night is acceptable, even desirable, especially when breeding the snakes. When using an under-the-enclosure heater, make sure that it covers no more than 1/4 to 1/3 of the floor area. The snake must be able to move back and forth from the heat to the cooler areas of the cage. If you notice that the snake spends all of its time on one side of the cage or the other, the gradient may need some adjustment. The temperature of the ball python cage can be controlled by a thermostat, a dimmer switch or just by matching the proper heater to the size of the cage. A thermometer is essential in monitoring the temperature of the cage. I get many calls from snake keepers experiencing problems with their snakes who do not even know the temperature of their snakes' enclosures. The temperature registered by the popular adhesive strip thermometers do not accurately register the temperature of the enclosure; instead, they measure the temperature of the wall itself. The wall or glass side of the cage is influenced as much by the temperature outside the cage as it is by the temperature inside the cage. The thermometer should be placed so that it gives the temperature in areas where the snake spends its tune. For ball pythons, this is at floor level. Temperatures in other locations are less relevant. If you do not use a thermostat, be aware that fluctuations in the temperature of the room where the snake is kept will cause a corresponding change in the temperature of the cage. The amount of heat required to obtain the proper temperature depends on several variables, most notably the size and construction of the enclosure, and the placement and size of any vents. Larger cages will obviously require more heat, but there are also other considerations. Cages constructed of plywood retain heat more efficiently than those made of plastic or glass. Some ventilation is necessary, but both heat and humidity can be conserved by reducing the amount of ventilation in the enclosure. Vent placement is important. Because heat rises, vents placed on the top of the cage will allow more heat loss. This will require the heater to work harder to heat the enclosure and will reduce the humidity as the added heat dries the cage. Ideally, vents should be fairly small and placed on the sides of the cage. A glass aquarium with a commercially produced screen top, although commonly used to house other reptiles, can be a problematic enclosure in which to properly maintain a ball python. The snake should have access to water at all times. Heavy ceramic bowls are difficult to tip. Those with larger surface areas help contribute to the cage's humidity level through evaporation. Place the water bowl on the warm side of the cage to enhance evaporation. The warm temperatures of the cage also promote bacteria growth, so it is important to keep the bowl clean and to change water regularly. There are several acceptable substrates for ball python enclosures. I use newspaper because it is inexpensive, absorbent, relatively sterile and readily available. Some shredded wood products strike a better balance between utility and aesthetics. Aspen and pine are available in many pet stores, but you should avoid cedar. Cedar shavings, frequently used for rodents, may be toxic to some reptiles. Astroturf and similar products are easy to clean and sterilize and can be cut to the appropriate size. Naturally planted vivaria can be beautiful, but they are difficult to maintain and keep clean. Ideally, ball pythons should be purchased as captive-born hatchlings from breeders. As a breeder, myself, its a little self serving for me to say this, but it is still the best course of action. Animals produced in captivity do not deplete the wild populations and disrupt the natural system from which they were taken. Captive-born animals do not have the acclimation problems that wild animals often have. This transition can be especially difficult for adult ball pythons. Captive-born animals are free from parasites and the scars and injuries that come from living in the wild. They have avoided time in the care of exporters, importers and dealers that may not have given them proper care. Baby ball pythons are one of the most available reptiles in the market today and most of these are bred in the wild. In late April and May, babies are hatched from eggs collected from wild females in Ghana, Togo and Benin. These babies are exported in huge numbers. Even though they are bred in the wild, the eggs are hatched in captivity. Most are exported within days of birth. If they have been well cared for, they make perfectly good pets. The first-time snake buyer is most likely to encounter these snakes. When selecting a baby ball python, the snake should have good body weight and muscle tone. It should appear well hydrated and be free of remnants of the last shed. If possible, confirm that the snake has been feeding. Ball pythons are tremendously undervalued in the market today and, as such, are not always treated with the care and respect they deserve. If it's not possible to get a snake that has been properly cared for, at least get one that is "fresh." Some adult ball pythons imported from the wild have a difficult time acclimating to captivity. Often, they refuse food for extended periods. Ball pythons are long-lived animals. Their longevity record in captivity is nearly 50 years. This may or may not be typical, but it is possible that some of the wild-caught adults in the pet trade may be very old. The transition can be long and difficult for these animals. It is not hard to imagine the shock of a wild snake that finds itself in an aquarium in the bedroom of a 13-yearold in Cincinnati. Nearly every one of these stubborn snakes eventually feeds. Several things can be done to help the snake acclimate. First, make sure the temperature and humidity are within an acceptable range. Next, give the snake a place to hide. Remember, these animals live in burrows in the wild. The ideal hide box should have a fairly small opening, be dark and allow the snake to feel hidden. This will reduce much of the stress in its life. The container should be small enough that the snake can feel the sides of it when inside. Understand that in the wild the snake would rarely be seen out in the open, where it is vulnerable to predators. In the snake's mind, you are a predator! Do not handle the snake until it has begun to feed regularly. Handling will extend the period of adjustment. If the snake wont eat a mouse, try offering a rat. If a rat doesn't work, gerbils seem to entice many stubborn feeders. Remember that although the snake may have been feeding on mice and rats in the wild, our rodents are different species and might seem totally foreign. Many captive snakes learn to eat dead food, but it is rarely encountered in the wild. You will achieve the best results with live prey items. Try to feed the snake weekly; more often is counterproductive. Be patient. Some snakes may fast for a year or more. Baby ball pythons will feed readily on half-grown mice. The hatchling pythons are small and many first time keepers feel that smaller food items are appropriate. Although some will eat pinkie mice, a larger more active mouse is more likely to trigger a feeding response in a snake that has never eaten. Larger snakes can take larger mice, two mice, small rats and eventually adult rats. I have one large ball python that eats small rabbits on occasion. Never leave a live food item in the cage unattended. If left uneaten, a live rodent can injure the snake. Feed the snake once a week. A little more or less is also good. I keep records of each snake's activities, noting feeding, shedding and breeding activity. 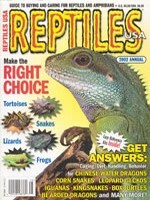 These kinds of records can be used to help better understand or illustrate the snake's behavior over a period of time. Some ball pythons, especially wild caught animals, will fast from time to time even though they had been feeding regularly. This is not usually cause for alarm. Make sure all the cage parameters are correct, continue to offer food weekly, and be patient. Most resume feeding after a while. Most captive-raised ball pythons are willing breeders. Breeding can be encouraged by allowing the nighttime temperatures to drop into the 70s in the fall. Pairs will often breed soon after this temperature drop. Copulation occurs over a period of several weeks. Females develop follicles, ovulate and lay eggs over the next three to four months. Clutch sizes range from three to 12 eggs, and average about seven. Eggs can be incubated by the female or artificially in an incubator. At 90 degrees Fahrenheit, eggs will hatch after about 55 days. There is little variation in the color and pattern of wild ball pythons, although there are some notable exceptions. Several of these have proven to be genetic. These traits are now bred and available to collectors. Many are highly sought after and carry high prices. Most have been bred from one, or just a few, wild-caught individuals. Because ball pythons have small numbers of offspring and breed once a year at most, it takes a long time for these new traits to become established and readily available. Several interesting types are currently available, and new ones continue to occur, although infrequently. The ball python, because of its appeal, availability and price, has become one of the most commonly kept reptile pets today. They are docile, undemanding and thrive in captivity. In fact, I've been keeping ball pythons for nearly 30 years, and they are still one of my favorites.